Seven Impossible Things Before Breakfast » Blog Archive » 7-Imp’s 7 Kicks #134: Featuring Ted! When he needs something and can’t find it, why, he just makes do on his own. 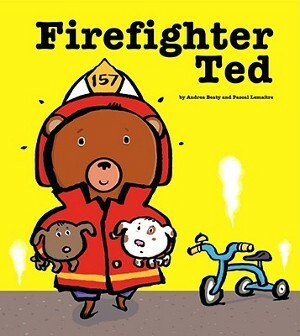 This time, in Firefighter Ted (Margaret K. McElderry Books, September ’09), he tries on the firefightin’ profession for size, since he wakes up smelling burning toast. 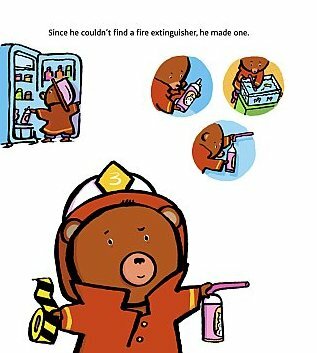 If you click on the smaller, second image above and left, you’ll see how he makes his own fire extinguisher. (And you can enlarge the image to see the entire spread from which it comes.) Ted cracks me up. And, once again with Ted, Beaty nails a child’s need to play-pretend, to learn through role-play, and to simply assert himself in a world full of adults and their tendency to sometimes dismiss this type of imaginative play. 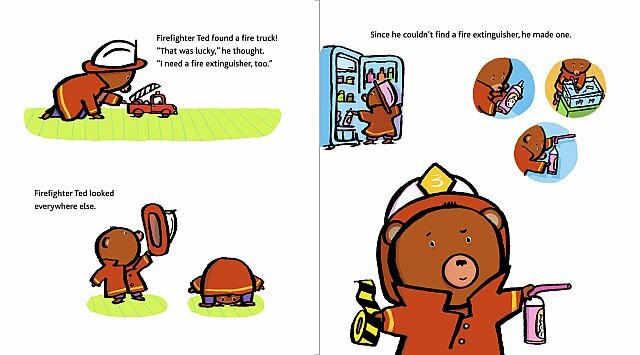 FIREFIGHTER TED. Text copyright © 2009 by Andrea Beaty. Illustrations copyright © 2009 by Pascal Lemaitre. Published by Margaret K. McElderry Books, New York, NY. Images used with permission of author and illustrator. All rights reserved. Hey! The husband and I are entertaining this weekend – his sister and her husband are staying with us for a few days. 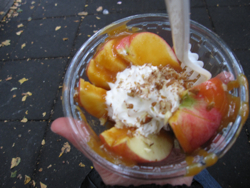 Saturday we did the Corning Museum of Glass, and ate a whole mess of fried and/or caramel-coated stuff at the Apple Harvest Festival (just look at that caramel apple sundae there. That was MINE! ), and today we’re going to the Farmer’s Market, a waterfall or two, and then to the premiere of a short film for which my husband did art direction. So I’m kind of scarce, ‘net-wise, right now. But I look forward to reading all ya’lls kicks when I get a breath. 1). As mentioned above, reading to my daughter’s kindergarten class this week. 2). My neighbor, who will come over to help me when, say, a blue-tailed skink has gotten into the house (or been brought into the house through a cat door) and I pick up two different segments of its tail, still wriggling, from the living room floor and then I see the rest of it scurrying around and nearly hyperventilate. 3). Saving the Best for Last: My five-year-old was sick this week, but the high fever didn’t last too long, and she’s better now. BONUS: I’m a serious Saturday Night Live geek, as in one of those people who likes it even during the dark times in which everyone else doesn’t. (And ask Eisha: I have an SNL reference for just about everything in life.) Since the season premiere is tonight (that’s “last night” to you reading this on Sunday), I’m off to go watch. I’ll leave you with dress-rehearsal bloopers from “Weekend Update,” if you’re so inclined to watch. (Sorry about the ad at the beginning). Kudos to service animals. 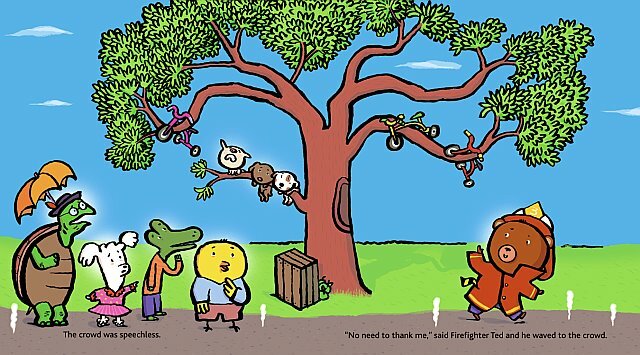 I started writing something about Firefighter Ted being adorable, which is true, but then I started thinking about our amazing defenders and protectors – as your daughter’s class put it, “community helpers” – and not just the humans we may see or celebrate on a more regular basis than, say, the seizure-alert dog. They deserve credit and honors as well. eisha: Sounds like a fun weekend full of art and entertainment. Get some yummy fruits and veggies at the Market, and rock that premiere! Tell your husband that I send my kudos and congrats. Jules: Aw, poor skink. Hi, kitty. Glad that cinco de munchkin is feeling better now. A high fever? Poor thing. Never fun for the afflicted OR the parents. I have a friend who loves recent SNL, and she makes sure that I watch certain sketches she finds hilarious. The Madonna/Angelina Jolie Weekend Update has become something from which we quote at random moments. It’s been a kicky week. It’s also been a stressful week. You know how I sometimes say I’m crazy-busy? Multiply both the crazy and the busy – which thereby upped the anxiety and tension for some things and the hope and happy for other things – and that was my week. This is all on top of my 45-hour workweek AND my currently running show AND my about-to-open show. Every day feels like it’s two to four days because it’s segmented into so many things. If all goes well, I’ll make my post here next Sunday more forthcoming/detailed, but for now I’ll share the fact that I booked three projects. One shoots today (Sunday), another (the nature of which – not the content, but the forum – marks a huge milestone for me) shoots later this week, and the third (which could be a different milestone/marker) shoots a week from now. These things are actually going to happen, and people will actually see these things. I’m excited. There’s a kick here, don’t worry. The kick is that my loved ones and I are among the safe and sound. Our homes are a bit damaged and some of our possessions have been lost. But we are all okay and I am grateful and thankful for that. Eisha, that sundae, can you send it through the Internet,please? Yum, what a way to eat fruit. Jules, glad daughter is on the mend and how wonderful to get to read to her class. LW, your projects sound so exciting. Fingers and toes crossed for the week ahead. 6. “Have you ever read any “5 fingered” books?” question by 5th grader. You know, how to determine a book’s difficulty? Got to talk about reading Beloved, my 5th fingered book. 7. K’s got to check out books for the first time this week. Always exciting. Tarie, glad to hear you are safe and sound. First of all, Tarie: Whew. So glad you’re safe and that your family is safe, but I’m so sorry this happened. It must be difficult to see all that destruction and loss around you. Thank goodness you are okay. Little Willow, I’m sorry you had stress this week. I hope next week is better, but it still sounds like you had a happy week. Your life is very full. Good luck with your shoot today; yay for milestones; and keep up updated, as always. p.s. The skink was okay. I certainly didn’t want him to perish, but I didn’t want to be the one to pick him up. Jone, congrats on the book fair — successful AND all over. Yay for the kindergarteners getting their books…and Fall weather. We have a bit today, too! Oh, and Tarie: Thanks for taking the time to let us know YOU AND YOUR FAMILY ARE OKAY! Okay, where was I? Just stopping in briefly to say hello since my in-laws are due to arrive any moment now. 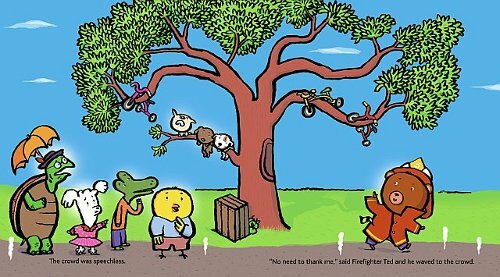 So glad to hear Piper is okay, and Firefighter Ted looks like so much fun! Don’t you just hate it when skinks come in your house and wiggle around in separate parts? Ewwww! Eisha, I’m drooling at that apple caramel sundae thing. Looks like we’re both entertaining spouse sisters and hubbies this weekend. Have a great week and Happy Autumn! Oh, thank god you and your loved ones are okay, Tarie!! So sorry to hear about the damage to your house. Will keep you in my prayers this week. Jama, thanks for stopping by, even when you’re busy. You picked SUCH EXCELLENT BOOKS to give away as gifts, which I agree is such a fun thing to do. Have fun with your family! So glad you’re okay, Tarie! I saw you check in on Twitter, and I was relieved. 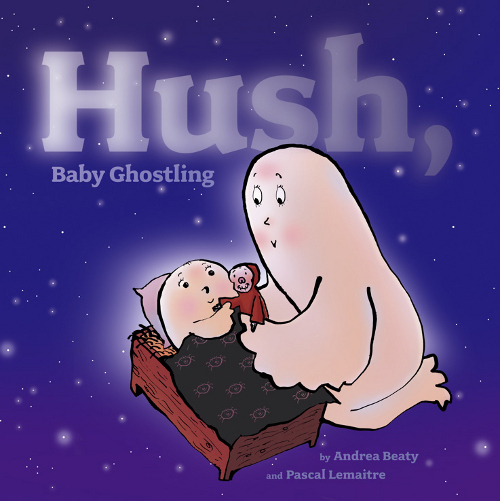 Jules, your wee one is booktalking ALREADY. Yeah. Next, she’ll be whipping out the felt board. LW: You lead an amazing life. Jama: Thank you for bearing my book all the way to Hawaii. I’m thrilled. You know, I haven’t tried a Ted in storytime yet. I’ve added that to my list of things to do. eisha, It’s all apples all the time here, too. Yesterday, I made apple crisp. Mmmm. Jules, Will you be reading to Miss Piper’s class on a regular basis? I’ve loved being able to go into Lucas’s classes through the years to tell stories and read to them. When we all went to open house last week, I got several, “Oh, you’re Lucas’s aunt!” “I remember when you told stories!” “Are you going to come tell us stories again?” This is rewarding. Little Willow, So true about service animals. And I look forward to next week’s update–may your energy hold out with all that busyness. Oh, Tarie, I’m glad you all are safe. Jama, I’m off to visit friends next weekend, and I have been very happily amassing books to bring with me to give to the kids. I love spending time thinking about what they might like and picking out just the right thing, and these kids are all book lovers, so that makes it even better. 2. Apple picking and the subsequent making of apple crisp and applesauce. 3. I had a home energy audit done this week as part of exploring an insulation upgrade I’d like to do. It was interesting, I learned a lot, and I felt like a responsible homeowner. 4. I had kind of a meltdown midweek about a few things I wasn’t sure I could handle, but I took a deep breath, asked for some advice, and handled everything just fine. 5. I also made chili this week. 7. And there’s my father-in-law ringing the doorbell for his Sunday stop-over. That counts as a kick, too. Actually had kicks that I couldn’t wait to share, so what better place to come but here! 1. Contract issues resolved to great financial relief. 2. Just enough kids signed up for Drama Club but not too many. 3. Ruining new Girl Scout troop, while a busy venture, is going to be a blast. 4. My wonderful sweetie pie niece is here to visit for the weekend. 5. My cold is on the mend. 7. My daughter Erin was got to read the part of Piggie to Mo’s Gerald onstage for the book Today I Will Fly and she did amazing and it was incredible to watch and I can’t wait for the webcast to go up! Tarie, I knew NOTHING about the typhoon until reading your note. I’m so sorry for what it’s done, and very glad it hasn’t done more. Like Jules said, thanks for posting to let us know you’re all right! Eisha: Love today’s agenda. Especially “a waterfall or two.” Makes it sound like you can pretty much go for a drive and take a left any old place and, my gosh, there’s another waterfall!, wanna get out and look??? Jules, one of the things I like about 7-Imp is learning all the things people here are “serious geeks” about. (And thus feeling a little less… less strange about my own geekeries.) Somehow your SNL geekdom comes as no surprise; maybe you’ve mentioned it before, maybe not, but it just fits. Still, you won’t have crossed over into true virtuoso geekdom until you can hold those wriggling lizard bits and regard them with ain’t-this-something dispassion. I have a theory about Little Willow’s 7-Kicks comments, which is that they’re like the dots in a halftone photograph or comic strip — viewed from a distance of about a quarter-inch. Up-close like this — each Sunday — they’re kinda cool looking, very colorful and so on. But somehow I think we won’t get the full import of them all until, say, oh why not, seven years have gone by and we can look at the whole picture all at once. Jone: The “five-fingered book” concept is GREAT! Did the 5th grader come up with that on his/her own??? * I took off from work one day this week while we had a home-security system installed. (Long but innocent story.) The security system per se is pretty good, but I have to say my main kick about it is the anticipation of the comedy it will inevitably bring. * Seems to me that someone here recommended the Meryl Streep/Phillip Seymour Hoffman film Doubt. Watched it this week; a la Jone’s 5th-grader, it’s absolutely a five-finger flick. As The Missus will tell you, I hate complication but love complexity — Doubt has complexity (emotional, political) in spades. And watching Streep and Hoffman together, especially in the one big scene they have at the end… unbelievable. * Suddenly realizing late this week that I have no open projects at work (touch wood). Which means it’s time for some learning-type projects, until the next thing (whatever it is) comes along, probably late this week. * The Missus’s employer got a big federal grant this week — a huge load off of her mind. All of their minds, really — the project lives entirely on grant money and donations. * I think Roberta Flack’s “The First Time Ever I Saw Your Face” must be one of my favorite songs ever, and I just got to hear it the other day. She didn’t have anything to do with its composition, so it’s “just” a cover. But I think I read somewhere that her record producer discovered her singing it in a bar someplace (in DC, maybe? ), although she wasn’t actively looking for a recording contract — and I love that that became her signature tune. The “five finger” book rule is an oldie but goldie: Read a page, put a finger up for every word you don’t understand, if there are five: too hard, zero: too easy…and not to be confused with the five finger discount. First of all, Tarie, I’m so glad that you and your family are safe! How scary that must have been. Eisha, I think “fried and caramel-colored” can be a rather poetic phrase, don’t you think? Jules, I had to Google “blue-tailed skink”, and let me just say that I would be a quivering blob of plasma on the ceiling if that had been in my house. I still have goosebumps, just thinking about it. On a happier note, I’m glad Piper is feeling better, and I love the SNL video – I just love bloopers in general. LW, I’m excited for your 3 projects, and look forward to hearing more! Jone, I wish we had amazing fall weather here, but it’s still about a bazillion degrees. Jama, books make the absolute perfect gift! Sara, here’s to book festivals, book fairs, book sales, and well, BOOKS! Adrienne, I had a slight meltdown myself this week – glad to hear that everything turned out okay for you. Would love a piece of apple crisp! MotherReader, what a great author lineup at the book festival! JES, I loved “Doubt” also and highly recommend it. We seem to have similar taste in movies. Absolutely LOVED the Barry White article – I won his song “You’re The First, You’re The Last, My Everything” in Junior High after a highly embarrassing dance contest (and no, I can’t dance…long, humiliating story) and always enjoyed his style. I think he would appreciate that story about the sharks. 1) Listening to a woman in her 50’s explain how her entire life changed after recently learning to read through the adult literacy program I am involved with. 6 hours of training yesterday and 6 more next weekend, but all worth it after hearing that story. 2) Going to the S.F. Friends of the Library Book Sale – found some Noel Coward books/plays and several beautifully bound books. 3) Watching the Georgia O’Keefe movie on Lifetime. Joan Allen and Jeremy Irons (as Stieglitz) were fantastic! Hope it comes out on DVD. 4) Talking with two people who have agreed to be mentors and assist with my future new business. I’m so grateful for their help and support. Hi, Sara! I cannot wait to read your post, as I’m pretty sure it will involve Sherman Alexie. Adrienne, a meltdown. Blech. So sorry. But I’m glad you have your friends to lean on for advice. Jill and I were talking about meltdowns this week and how, when you have one, you imagine that no one else in the entire world has them. And I was just telling my husband that we need to buy better apples and snack on them. More often, that is. MotherReader, that is terrifically cool about Erin, and I can’t wait to see the webcast! All your kicks are good, but that is particularly great! John, wish I had that dispassion about squirmy, stealthy, crawly things. Instead, while I can acknowledge that they’re fascinating and beautiful and nature’s works of art, I have this very deep-rooted, little-screamy-girl fear of their stealthiness. And how they can suddenly just BE THERE, scaring the crap out of you. I can’t explain it. The SNL geek-dom knows no bounds. I’ve been a fan since high school, which I still contend were the best years — the Phil Hartman (god rest his brilliant soul) and Dana Carvey and Jan Hooks and, later, Mike Myers years. And, yes, wasn’t Doubt great?! I not only love Meryl Streep’s acting, but when I see her in interviews, I want to just hang OUT with her. And her personality reminds me of Eisha’s wonderful mom sometimes. So neat to read about where your wife works (and to read about *her* at the site, though I promise I won’t stalk you all). Oh, and when I hear Roberta Flack sing “Do What You Gotta Do,” it takes me back to a particular time, and I get particularly teary-eyed. Almost too hard to hear, even just for the passion with which she belts it out. “My wild, sweet love…” Ah. Goosebumps-inducing. Jill, kick #1 seals the deal for me: I have been wanting to sign up to volunteer on adult literacy projects, even going so far as to call about a training (though no one called me back), so now I really need to be more aggressive about it. What a great story! I want to see you dancing in junior high! Anyway, briefly: I stared and stared at that image of Ted’s fire extinguisher. Even downloaded it and blew it up to gigantic pore-revealing-closeup size. But I’m still not sure. Is that… no, it can’t be… a can of whipped cream? with the hose from an aquarium pump attached to it?!? I’m not sure which is more entertaining — the thought of how much that idea must appeal to the brains of kids everywhere (and all the ensuing kitchen disasters), or the thought of all the little goldfish lying around their tank heaving, gasping for air, clutching their gills, while Ted is off fighting fires. Sara: LOVED your post on the National Book Festival! Adrienne, you had some great kicks this week — the energy audit was exactly the kind of kick I’d experience, although I’d be afraid to tell anyone because they’d all be like congratulating me on my stewardship of the planet etc. etc…. while I’d just be reveling in the science and sheer interestingness of it all. MotherReader, I loved your kicks this week, too. (Another National Book Festival-goer!) But I have to admit I LOL’d at what I hope was a typo in Kick #3. Jill: I’m with Jules. You don’t get to say “I won something in a dance contest” and then follow it up with “I can’t dance” without being double-dog-dared by your audience to PROVE you can’t dance. And I caught the very last, like, 30 seconds and closing credits of that O’Keefe/Stieglitz film and thought, How did we miss knowing about this? John, yes, I wish the spread were bigger, but he takes a fish-tank tube (I’m sure it has a more precise name) and some whipped cream and puts out fires with them. Again: Beaty is good at understanding the minds of children, huh? Oh, I just saw the “ruining,” John, since you pointed it out. Very funny. I can hear MotherReader laughing at her own typo now. Or, knowing her, maybe she meant it?! Mwahahaha, she might be saying. Okay, I’m going to sound all rainy-faced, so forgive me, but I read somewhere that Flash Forward or whatever that show is called that you’re talking about might have had some Lost references in it, and that just makes me feel STABBY. I mean: COME ON. I dunno…I’m just really, really annoyed with Lost, and the feelings are just extra strong, I guess, since Season One and most of Season Two were just so damned interesting. And now they’re throwing references to the show into OTHER shows. Blerg. I haven’t even figured out if I’m going to watch Lost this season, but then—as my husband was saying—we’ve come this far. Why not see how they pull this mess together? Isn’t it the last season anyway? Sorry. I don’t mean to dampen your enthusiasm for Flash Forward. Maybe it’s a fabulous show, and hey, Joseph Fiennes is a great actor. Tarie, I’m so glad you’re OK! And everyone’s kicks are great. It must be visiting season, my mum is out at the moment so we’re busy running around and catching up. That is worth seven kicks! “Rainy-faced”: I have to remember to use that in conversation. Just love watching people in mid-whiplash. I saw that an actress who plays a 2nd-tier role in Lost (Desmond’s Penelope) has the female lead in FastForward, but hadn’t heard about any other references. And the blogger who reviewed it is a Lost fan. She speculates, though, that ABC is trying to lay the groundwork now for retaining Lost‘s audience after yes, this upcoming final season. I’m with Blaine. Stick with it. And despite the aimless even-the-kitchen-sink feel of some recent episodes, I still think they’ll pull it off without lapsing into Dallas-style “…and then Bobby woke up” gimmicks. I know, I know. Pie-eyed dreamer, what can I say? Emmaco, have fun with your mother! John, yeah. I probably won’t be able to do anything but see how this saga ends. Plus, I like Desmond. Brutha. JES and Jules, trust me – you do NOT want to see me dance. Briefly, in Jr. High I was asked by a boy wearing a John Travolta in “Sat. Night Fever” white leisure suit to dance (all of this is true, unfortunately). I reluctantly agreed, and walked over to the middle of the dance floor in my hideous, dark blue crushed velvet long dress (this was in the 70’s, by the way). The boy got down on the floor in front of me and began spinning around in a combination break dance and disco routine, to my abject humiliation. Everyone moved over to give him room to do these gyrations, and then my Physical Ed. teacher decided to shine the spot light on us, so that everyone could view this spectacle. And what was I doing? Basically standing in one spot, moving only my feet from left to right, and wishing desperately that the floor would open up and swallow me. For that, we won the Barry White single (obviously, with no contribution from me), and I have had a dance phobia ever since. Jules, Alexie was at the Fairfax Fall for the Book Festival, which I also wrote about. (Just call me a festival fool) I WISH he was at the NBF, too, but I have a feeling that he was a bit too….himself….for families wandering about. Also, Meryl Streep on the Colbert Report was the cutest thing I’ve ever seen. She giggled like a ten-year-old at his jokes. Jill, that story just made. my. day. Sara, wish I could have seen Streep on the Colbert show. Will have to find a video. Off to read your post…finally! Hmmm, I see a future for Ted in our house. Tarie – I am so glad you hear that you and your loved ones are safe. Eisha – have fun with your guests. Jules – I honestly had no idea Kindergarten would be so full of germs. Cy has missed two days already and my friends grandson has missed 7!!! They should all wear facemasks. I’m glad she is better. And you must stick with LOST. I can’t imagine not knowing how it ends. Adrienne – I love kick #7. Emmaco – isn’t it great when mums come for visits? Little Willow – good luck with everything you have going on right now. 1 – No longer having to watch the Transformers movie. Every. Single. Day. Now “WallE” and “The Road to Morocco” (or “The Funny Guys”, as Cy calls it) are flavor of the month. Yes, my 5 year old has very eclectic tastes in movies. 2 – Ruby’s taste in youtube videos is equally eclectic. Her current favorite is this one: http://www.youtube.com/watch?v=ryIW15PQ_O0 At 21 months, she clearly recognizes the genius that is Michel Gondry. 3 – Convincing my director that the Twilight series would be an excellent addition to our library collection. 4 – Finally getting to flex my Study Abroad Coordinator muscles. 5 – “Fat Kid Rules the World” by K. L. Going. I didn’t want it to end. 6 – My in-laws house in Gwinett County GA survived the deluge and has finally been sold. Closing is next month. 7 – My mother-in-laws last radiation treatment is tomorrow!!! She is doing great. Scary stuff, Tarie. Can’t believe your whole first floor was submerged…what a mess. Glad you’re ok.
Little Willow, even when you’re stressed, your life sounds more awesome than average. Adrienne…I share your love of apple picking and the subsequent making of apple crisp and applesauce. Jill your dance story terrified me. And I found it hilarious as I cringed on your behalf. Zoë , I hadn’t heard of Michel Gondry — that’s fantastically messed-up stuff. Also, my wife so wanted a Ruby, but it’s mostly my fault that our youngest daughter ended up an Ella…I should have listened. 1) Despite breaking my thumb mountain biking last week (an anti-kick! ), I felt so thankful that it wasn’t worse. With a high-speed tumble through rocks, a broken thumb didn’t seem so bad. 2) The Secret of Roan Inish — we read the book (also known as The Secret of Ron Mor Skerry) as a bedtime read over a few nights and the girls adored it. Now we’re going to watch the movie, which looks charming. 3) I submitted my ice book as part of an artist’s proposal to get the photos shown in our local art gallery. Although it would be a *real* kick to have it happen, just having the courage to submit it felt good to this first-time artist. 4) Three days off this week! Tannis is taking the girls for a homelearning field trip (oxymoron?) to Vancouver, so Ezra and I are hanging out here. 5) Rediscovering my camera…I didn’t take many photos this summer, but photography is one of the few things I can do with one hand. 6) Fall vegetables — the local fruit/veggie stands are jam-packed with goodies these days…bountiful harvests of tasty stuff. 7) Getting my cast off on Friday, and hopefully getting a smaller, removable one. I need to be able to play the viola again! 1. two days of parent teacher conferences, monday and tuesday, followed by four day weekend. Zoë — Ruby must have a very resilient mind. While as an adult I can appreciate that Gondry video, if I’d seen it as a kid it would STILL be giving me nightmares. I also find that video a little creepy, but Ruby loves it. She comes by it honest though. We discovered Oui Oui (the band) several years ago when a friend of ours lent us a DVD from a series that features famous director’s music videos (Spike Jonze has one too). He knew we were a fan of Michel Gondry’s movies so he thought we would get a kick out of the videos. Little did we know 4 month old Cy would be become a huge fan. Maybe it’s the fact they are singing in french, but it’s probably the wacky animation. Jill and Jules, I am so glad it is not just me with the meltdowns. I don’t have them so often, but sometimes life just overwhelms me. JES, The energy audit was HIGHLY informative; I learned so much just going around and watching them do the tests. I also visited my attic crawl spaces, which, okay, I’d never, ever done before. And I’ve lived in this house eight years. I had kind of envisioned it like a post-apocalyptic landscape, but it was really quite nice up there. Jeremy, The broken thumb will completely interfere with fall-ish apple-based activities; I will hope for a quick recovery for you. Zoë, heh. I’ll have to show the girls that video tomorrow. Congrats to your mother-in-law, as well as YOU for flexing your study-abroad-coordinator muscles. And now I need to know what music video(s?) Spike Jonze directed! Hi, Amy. “Quiet brain.” I like that. And live theatre, which I don’t see enough anymore. I already left a comment saying as much, but your post over at your blog about The Hour I First Believed has made me want to read it even more. Adrienne and Jill, find me someone who doesn’t have meltdowns, even if only rarely, and I’ll give you eleventy billion dollars. Great to read everyone’s kicks! Haven’t been here for awhile (but I’ve read every week) due to family events, like my sister moving out of town on short notice (a kick for her, no so much for me). 2) So, so, so excited to see pages from the Ted book! 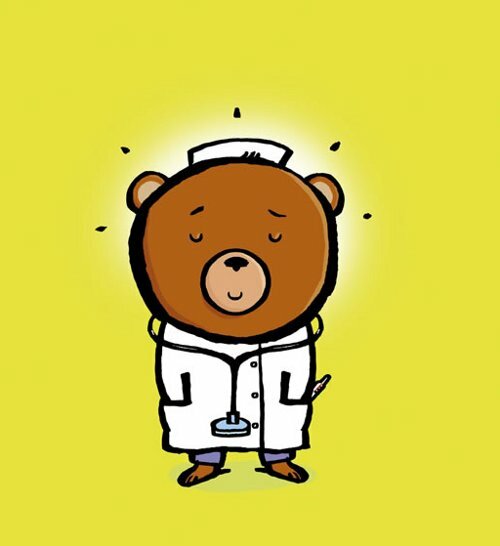 I’ve just been reading Dr. Ted to my library kids & loving it and saw in Horn Book that the FIREMAN book was coming, so shouted with glee when I saw your post!!! 3) My parents just had birthdays, 82 and 83, and are in pretty good health! Blessed. 4) My niece’s husband just got rehired by the firm he was laid off from in the CA Bay Area a few months ago 🙂 I hope good things like this are happening for many others. 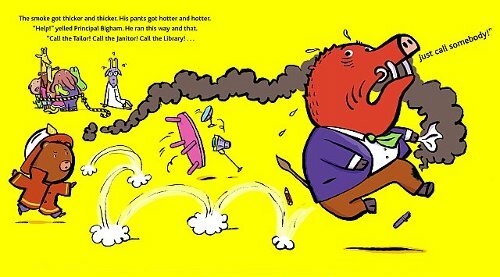 5) Figured out how to make storytime for my younger classes better this week, for the first time they were being truly awful, due to the crowding with the big class sizes we now have again in CA. 6) Disciplined at work this week. 7) Feeling in the know because I watched FlashForward, altho I’m reserving judgment (not really a sci-fi, fantasy fan) but I can see it has possibilities. Never watched Lost but my daughter is crazy about it & very irritated that she hasn’t been able to see FlashForward yet! (It’s by the same people.) Myself, I loved the Good Wife, amazingly good job with the topic–family dynamics and all. Oops, grandson was choking, not chocking! See how upsetting it was!? Oh, and yesterday his dad made him “Johnny Appleseed” pancakes with the recipe he got from K-garten. I love that! I’m going to read kicks tomorrow, but I wanted to drop in quickly tonight to say hello. This weekend was glorious with autumn sunshine. I got to do some reading, too. PLEASE keep the Philippines in your prayers this week. Another typhoon is scheduled to hit Wednesday. And with entire neighborhoods washed away in the floods, I don’t think we can take anymore and I want to cry. Andrea, so good to have you back! Thank goodness your grandson was okay. Way to keep grace under pressure, too. How’d you change your storytime for the younger classes to make it work better? I’m curious. Farida, woot! We had some nice weather, too. Tarie, oh crap. I’m so sorry. Will keep you all in my thoughts this week. I’m going to email you right now, too. Andrea, since your #6 is a kick, I’ll assume you were happy with your discipline in getting work done, not that you were disciplined by an angry overlord. Oh, Tarie, I am sending you and yours lots of strength. I wish I could do something more than that. Please stay safe. More reactions later. Tarie first, safety first. I checked in with Tarie on Tuesday, I think it was. She’s fine — but was bracing for a new storm. Tarie, update us, if you’re still reading this thread! Jeremy -You are correct about #6. Darn those sentence fragments! Jules -Actually it was an actual physical fix to improve the time. I realized our bigger classes were too crowded on the story carpet–20 fit, 30 didn’t. So I just moved a few chairs to the back (the big kids soft ones) and let the teachers pick those who have been having a good day or been extra kind to sit in the special chairs! It has actually been working. This second week the teachers have even been moving chairs and thinking about who to pick without my even asking. We have some very young K’s–kids turning 5 since school started with a mix of preschool pros and those who never went to any kind of school before. It’s a challenge. Tarie and all–I have been thinking about you and all the others who’ve been hit by all this weather trouble. (that includes my nephew-in-laws family). What a heartbreak. At times like these I always think of Mr. Rogers who reminded parents to help their children focus on all the people who rush to help in emergencies. It helps calm me too! Sorry I didn’t respond sooner, I was sick earlier this week, think I had a mild version of of some kinda flu–yuck! Checking in to see if anyone has heard from Tarie yet this weekend. Keeping her family in my thoughts. Little Willow, I think she’s okay. I saw a FB status update, I think it was, recently. Let’s hope she checks in tomorrow. p.s. Andrea, glad you feel better. Whats up! I just would like to give an enormous thumbs up for the nice data you will have here on this post. I will probably be coming back to your blog for extra soon.